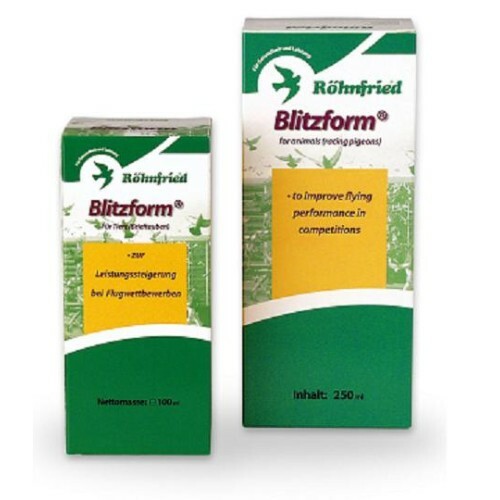 Blitzform 250ml - oxygen in the blood - by Rohnfried is one of the world's most famous tonics known for its good results in high competition. • Contributes to the pigeons that touch of extra strength and power. • It is a compound rich in iodine, which stimulates the metabolism. • stimulates the activity of the thyroid gland, causing a stimulation of heat. • Contains active iron, favoring the formation of red blood cells and therefore, increases the oxygen in the blood, causing an increase in physical performance. • During the season of high competition: When the pigeon is in competition, administer 5 ml per 2-3 liters of drinking water. Do not administer the days of release. • During the breeding molt, give 1 or 2 times per week 5 ml in 5 liters of drinking water.